We all know the story, the Native Americans shared their food with the starving pilgrims and all was well, thus creating the first Thanksgiving. That is the story at least. Native Americans influenced a lot of things the early settlers did, even the art of tattoos. Native Americans have a rich history with tattoos, and are at least partially responsible for the rise of tattooing in the American culture as a whole. Native Americans were getting tattooed long before the sailors landed on their shores. Their tattoos held great symbolism for them and their tribes. Warriors would get a time stamping style tattoo to show their victories. Several tribesmen (and tribeswomen) got tattoos representing animals, nature, even gods to show their appreciation. Tribes used the tattoos to show which tribe they belonged to. Some tribes even required tattoos be on their bodies before they could make it through the doors of the afterlife. The tribes had their own tattoo artists. Specific people in the group that were trained in the art of applying permanent ink to skin. They used crude instruments like rocks and fish bones to apply the artwork, which I can only imagine was painful, but the receiver got large amounts of respect among his fellow tribesmen by demonstrating he could handle the pain. 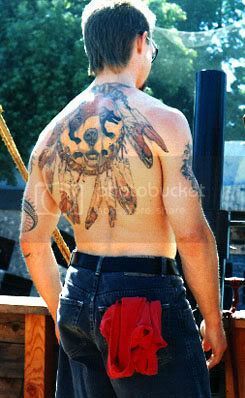 When the European sailors first came in contact with the Native Americans, they became obsessed with the idea of tattoos. They begin to get their own, in styles that reflected their lifestyle such as anchors and nautical symbols. People even started setting up shops along the docks. Tattooing became common place among sailors and soon among soldiers and settlers as well. Since then the popularity of tattoo art is found in every American culture, and it’s still going strong with Native Americans. Their has been a resurgence in Native American style tattoos the past few years, with people wanting to get tattoos showing their tribal heritage, or more universal symbols like feathers, animals, or tribal art. So remember when you are sitting down to your turkey this year, you not only have Native Americans to thank for all that maze the first year, (and all the land) but also tattoos. Read more at: The History of Native American Tattoos.